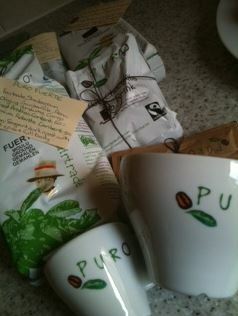 I was contacted by a coffee company I’d never heard of before called Puro. I had no idea what the coffee would be like but since I cover coffee, tea, chocolate, desserts, etc. I thought I’d best give it a try. Well, Puro sent me such a HUGE bag of stuff, I haven’t had a chance to try it all yet (as I don’t wish to waste it). Puro do a lot of stuff and their coffee is served a lot of places but it’s not necessarily what you’d expect. A large number of you might not have heard of Puro before because they don’t have their own cafes and you won’t find them in supermarkets. Still nevertheless if you drink coffee out and about and around town, then you will have probably enjoyed their without realising it! Yep – interestingly it seems that *every* National Trust site uses Puro coffee, restaurants like Gourmet Burger Kitchen and The Real Greek serve their coffee, large offices such as Innocent Drinks, opticians like Vision Express, hairdressers like Headmasters and golf clubs like Wentworth all serve Puro coffee. Why? Well as I discovered it makes more than just a half decent brew! I tried the organic coffee which is also Fairtrade. Now, I’m a little skeptical about “organic” as I learned from my time with Union that it can be, unknown to the people buying or monitoring, a bit of a scam. I’d love to eat less pesticides but what can ya do? Let’s hope most goes during fermentation. So anyway – I tried their “Puro Organic” which is described as shade grown organic fairtrade coffee from Peru and Honduras., It is 100% Arabica and it apparently has notes of sweet chocolate with a tangy citrus edge. Now, I’ve not been tasting perfectly the last 4 weeks so I didn’t get the chocolate but I did get the citrus and it is a gorgeous flavour. I thought it smelled burnt or at least slightly over roasted but actually it was brilliant and I was genuinely surprised. I’d say if you like a mellow coffee, choose something else because this has a personality and vibrancy to it but it is delicious as a coffee with or without milk. The Puro people are passionate about coffee and if my surprise (and my husband’s) at the quality of this coffee is anything to go by, they are absolutely on the right track. Just because they aren’t a tiny artisan coffee roaster doesn’t mean they aren’t doing great work and just because they don’t have a hipster brand doesn’t mean they aren’t great. The coffee I have tried has been great and they have sugar and hot chocolate too. Just to be totally clear, Puro Fairtrade Coffee is a brand from a company called Miko who has been roasting coffee in Belgium for 212 years now. It was created in 2005. So what? Well, Miko has 9000m2 of solar panels on the roof of their building to generate their own electricity for their factory. They might not sail their coffee to its destination but that does rock. In 2008, together with Sir David Attenborough, they launched a webcam in the rainforest. Spy on bugs and animals and drink great coffee while you do! 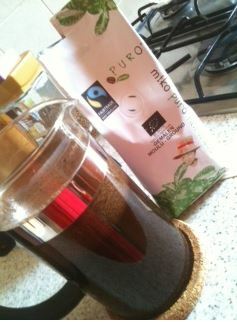 Miko won a business charity award last year for the partnership between Puro Fairtrade Coffee and World Land Trust. Why? Well I’m thinking it might have something to do with the fact that located within Chocó, Colombia, the 124 acre Puro Poison Frog Reserve is the only protected location in the world for the critically endangered and close to extinct Golden Poison Frog. Indigenous tribes still use their poison on their arrows and spears for hunting. Ewwwwww… but important and a wonderful thing for a company to be doing. Yes it is hard as a small guy to do but look at the AWESOME work that Shawn Askinosie does and you can see that small or large, it is your actions that speak.